The coat o airms o Sierra Leone (alang wi the banner), wur developed bi the College of Arms an grantit in 1960. The shield on the airms depicts a lion beneath a zigzag border, representin the Lion Muntains, efter which the kintra wis named. It an aa shows three torches which are meant tae seembolise peace an dignity. At the base are wavy bars depictin the sea. The supporters o the shield are lions, seemilar tae those on the colonial badge. The three main colours frae the shield - green, white an blue - wur uised tae form the banner. The green represents agricultural an naitural resoorces, the blue represents the Harbour o Freetown an the white represents unity an juistice. At the bottom o the shield, the naitional motto can be seen. 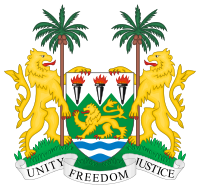 Wikimedia Commons haes media relatit tae Coats of arms of Sierra Leone.